Thinking about replacing your leaking metal roof? Our motto is Don’t Replace It….Restore It! 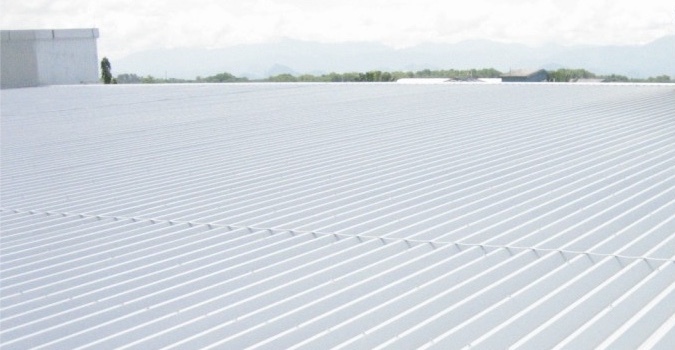 The more economical choice would be to restore your commercial metal roof with our unique process. 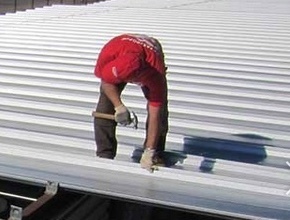 We can protect and restore your metal roof to practically new condition. Our superior high-tensile coatings are one of our premium components, applied after all of the roof’s issues and leaks are repaired. For color retention and protection against severe weather there is no better choice. There are great Energy Star rated and Cool Roof options to choose from. We also have the industries best guaranties and warranties. You don’t need to replace your roof as restoration is a terrific option. Through their design, metal roofing systems will always fail over time. The biggest culprits – seams, screws and fasteners. The procedures for water proofing for metal roof restoration and metal roof repair are somewhat alike. with restoration you’re making the entire roof watertight again, while with repair you’re just addressing the problem areas. Owners and property managers that are dealing with a tight budget may want to choose the repair option over restoration, as restoration, despite being much less expensive than replacement, is still a major project. You’ll need to determine how much of your budget needs to be used for the repairs. Understanding the need for a budgetary solution, we also repair the problem areas until the funds are there to cover a full blown restoration. If the fasteners are exposed on your metal roof, every screw could be a problem area. They each have a rubber washer that is installed to seal off water. But, over the years, this washer will crack and deteriorate, letting moisture through and into the interior of your building. Because metal roofs are installed with large sheets, the edges of each of these sheets could be a potential area for issues. Sever wind can wick water up and under the sheets and directly into your property. When the sheets are installed, there’s a sealant applied between each that is designed to prevent this. However, just like the washers, as time goes by it will break down and allow moisture up and through. As we said, one of the biggest reasons is energy efficiency. Compared to asphalt shingles or tiles, you will have significantly lower energy expenses. Your HVAC system will encounter much less use with a metal roof. As the roof is being installed or restored, you can even increase those savings by adding extra insulation underneath the panels. Eco-compatability is another big factor in choosing metal for your roofing material. Everything on a metal roof or restoration can be completely recycled at the end of their useful life, which means a lot less debris filling up our already overstuffed landfills. If you can find the funds for it, upgrading to a metal roof should be a no-brainer choice. You won’t find better protection for your building, employees or personal property and save a lot of your company’s profits over time. To help make your decision even easier, they have long comprehensive warranties to set your mind at ease. Commercial Metal Roofing Systems will give you an outstanding ROI because of their ability to last so long when properly maintained. Through hail, heavy snow, high wind and down-pouring rain, your metal roof will stand tall. The extra cost will be worth it, as it will last 2 to 3 times as long as other kinds of commercial roofing systems. 1- You may have an inferior roof coating product on your metal roof if its prematurely degrading. Acrylic products are usually a poor choice compared to materials made from silicone. Silicone isn’t prone to washing off, chalking, degrading, hazing or fading. These features make silicone a great material for use in repairing or restoring a metal roof. 2 – Silicone is better for the environment. Because silicone products have longer lifespans and lower VOC, they have a lower impact on the environment. For comparison purposes, you can compare Energy Star ratings with local assurance programs. 3 – Increasing your property’s insulation is something that would be worth looking into while you’re repairing or restoring your roof. On the outside, the SPF foam coating will reflect the sun’s rays and add a layer of insulation. 4 – You should work with an experienced commercial metal roofing contractor to compare the different silicone choices available. Every metal roof is unique to the building its installed on. We monitor every repair, restoration and installation or replacement we perform to constantly improve our process and the selection of quality materials and products we offer our customers. Taurus Elite Commercial Roof Systems, 512-332-4422, is a commercial roofing contractor based in Austin, Texas, and specializing in commercial metal roof repair, commercial metal roof restoration and commercial metal roof services in the Austin Texas area, including Cedar Park, for the last two decades.